Sudoku is a game, generator, solver, and statistics calculator. It has command-line options and well-documented manual page, plus nice UI to play. In game, you can save or load board, request a hint which might even give you which digit to try, it can also solve the board if you have given up. Sudoku was released in 2005-07 by Michael Kennett into public domain, continued by Peter Spiess-Knafl on 2015-02-12, written in C with ncurses, running on Windows and Unix-like, currently git-61e3f39 (2015-03-13, post v1.0.4 (2015-02-28)). I love this new feature. You can clearly see what you have done towards others repositories and the amount at when you do. That calendar is definitely the spotlight of the entire feature. Longest streak is probably the most interesting number among the statistics to me. Only 8 days streak coding, I must code harder! Coincidentally, I was thinking something Id call Contribution Ratio. Its basically calculating commits to others repositoriesdirect commit or via pull requests are all countedover total commits, then you have a percentage, the higher means you contribute more. 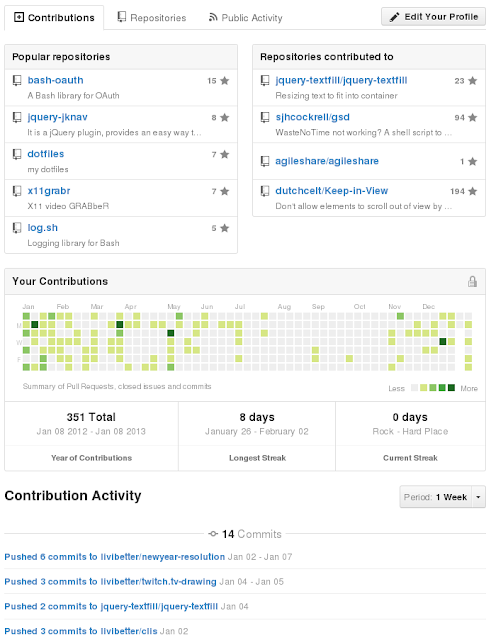 Although, it doesnt really indicate you have no contributions even when its 0%, you may be maintaining a popular open source project under your account name. Off-topic: as you can see I know use GetSatisfaction to handle feedback, previously Google Moderator. If you have any suggestions, please add it there. I want to see such number because I feel I havent contributed any recently, and would like to know how low my number is. However, I didnt start it, because itd be just a number, even that wouldnt take long to code it. If you want to see such number, add your vote on that idea. Yes, I know it's still 2012. When the clock tells me it's 2013, I will be too lazy to summarize it. Besides, Doomsdays is coming, we probably wouldn't have seen the new year. Yeap, I know. Again. Only silly people will believe Doomsdays is true, right? How could they not see the real threat is Juno? Moving the range one month ahead, so when it's said 2012 in this post, it means from December, 2011 to November, 2012. First, starts with the summary in case you just want to read the numbers. 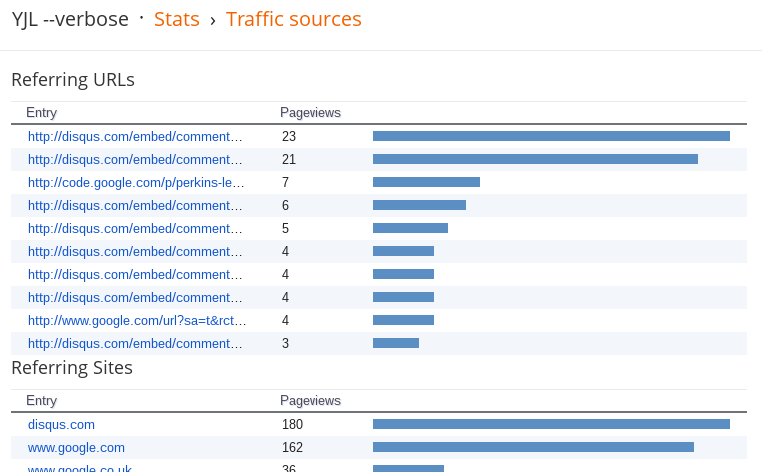 Blog: 331 posts and 85 comments. Code: 17,591 additions and 17,874 deletions. Gentoo: 1,056 merges and 999 un-merges. Last.fm: 4,711 scrobbles ~ 9.8 days (if each track is 3 minute long). Television: 1,240 episodes ~ 52 days. Film: 29 films ~ 2 days. gad: 35.47 (yjlv) + 76.18 (brps) = 111.65. With addition 10 spam comments. Most used word is, well, the "I," 3,170 times. I really need to quit that, heck, it's I++. Only 321 words per post, it's not very long. I wish my posts will reach 1,000 words in average in the future, though I won't keep that in mind when writing. Blogging shouldn't be like that, it should go with the flow of mood, not the word count. 2 (  2.4%): Fus Ro Dah! I can't even remember 7 of them which were written in 2012. It's not like I forgot the content, just too many posts that I couldn't recall when I wrote them. Compare to 2011, the numbers are doubled, even four months have no new posts. 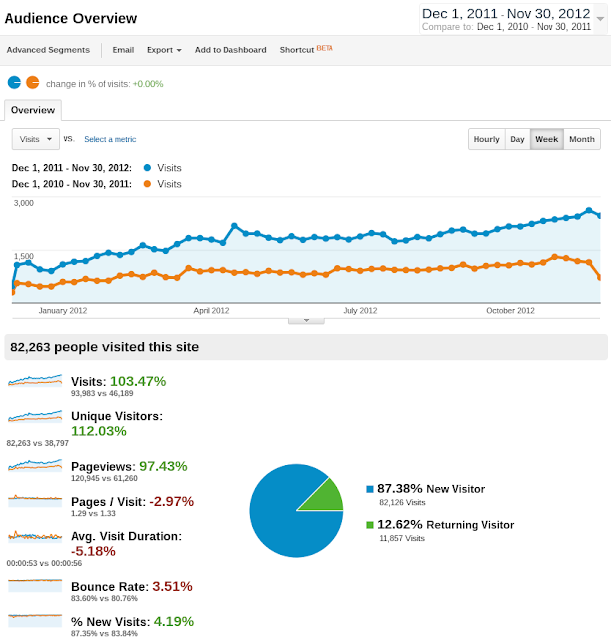 In Blogger Stats, the pageviews are 172,645, that's 42.7% more than 120,945 in Google Analytics. Top posts haven't changed much, three posts written in 2012 got into the list. 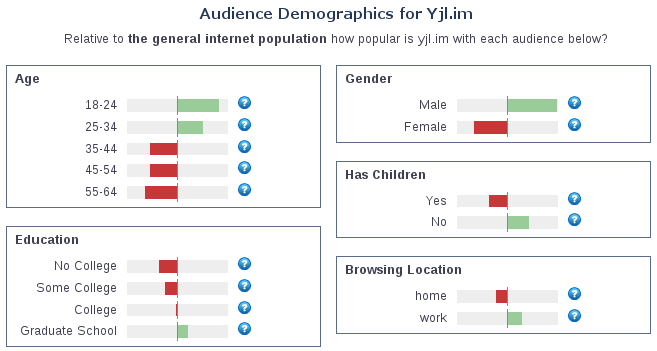 As for traffic sources, more people from search engine, which is not what I wanted at all. In 2012, I watched 1,240 episodes of television shows and 29 films. Just for rough average number 1,240 * 1h + 29 * 2h = 1,240 hours + 58 hours ~= 54 days. Holy cow, 54 days! I spent two months on watching television shows and films in 2012. I wish I was wrong but I took very detail records. After I watch an episode, I use VimNotes to take a record with timestamp. One episode per line, so grep and wc can get the correct numbers. I have been keeping record since October, 2010. If I was able to count my time spent on YouTube, that would definitely contribute a lot. 17,591 additions and 17,874 deletions. Only count towards some of my own repositories. Hold your congratulation line, don't get too excited for me. 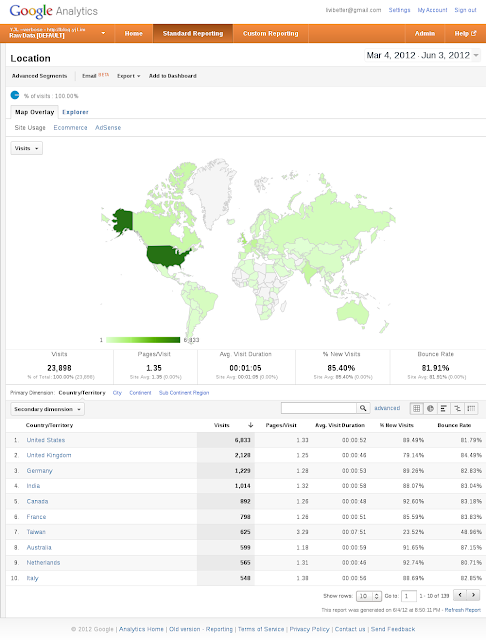 It may look amazing, reaching one thousand pageviews a day. 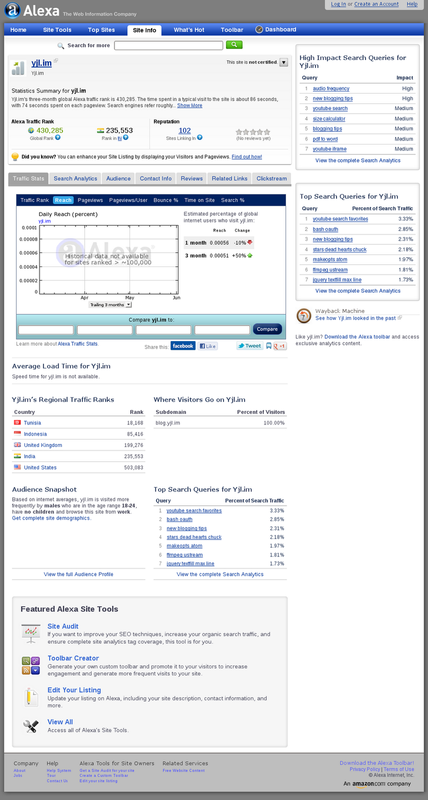 In fact, the record seems to be 1,056 pageviews when one post got into reddit. You can see there is a significant increase in last few days, that's when I made Disqus load with page, instead of load by a button click. I wanted Disqus Discovery, to be more precise, the related content since I had removed related posts. But it really came with a price, a bloated pageviews. I also checked on other website which has Discovery shown, same issue. If Discovery isn't shown, this won't happen. There must be a bug, because there is no need to load the page more than once. Well, it shouldn't be even once, actually. I can't really think of any reason for this. Right now, I have reverted to button-loading Disqus. It's not worth to bother readers' browser to load unnecessary stuff. 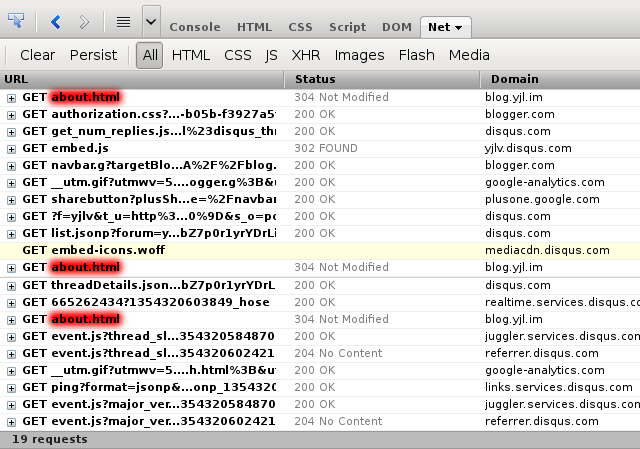 Disqus still loads a lot of stuff. More charts of published time by Year, Month, and Hour. For the additional charts, I wanted to see if I have particular posting hour. In most used words section, as you can see I use really lots of I. That is 3.2% of total words I wrote, its awfully a lot. 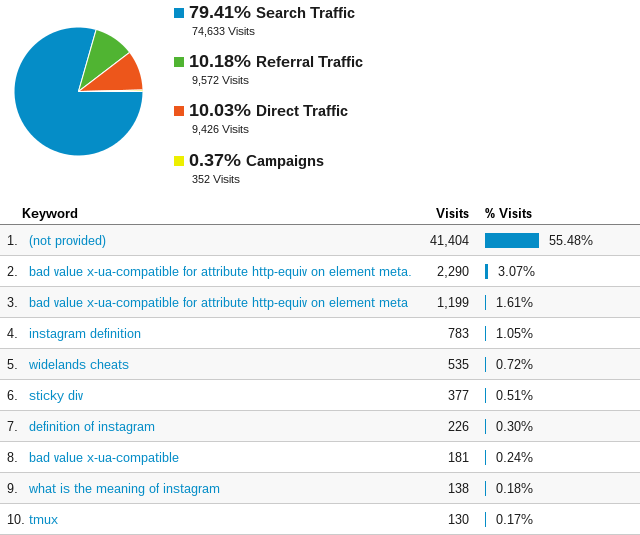 As for updating statistics, 95.5% of posts has been updated at least once. I created BEA because I desired seeing some numbers and I did. I will continue to add new stuff when something comes to my mind. If you have suggestions, feel free to leave a comment or create new issue. 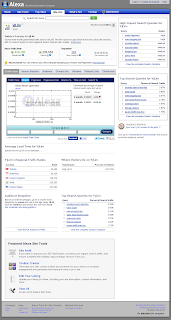 Blogger Export Analyzer (BEA) is a simple analyzer for Blogger Export XML file, that I created to get some statistics using data from Blogger Export file. I was hoping the Blogger Stats data is part of Export file, but they werent. The code is written in Python 3 and licensed under the MIT License. 34 out of 391 Comments are not counted in this section. 34 (  9.5%): Get ready for this Falling Snow Season! 0.062: Earth Hour, a one-hour globally fanatic phenomenon? 0.027: Get ready for this Falling Snow Season! The output is plain text like my Google Analytics report and I dont intend to add options for customization unless someone requests with good reason. The statistics you see in the image on the right is pretty much I have planned to have. I will only add new stuff when I get a new idea. 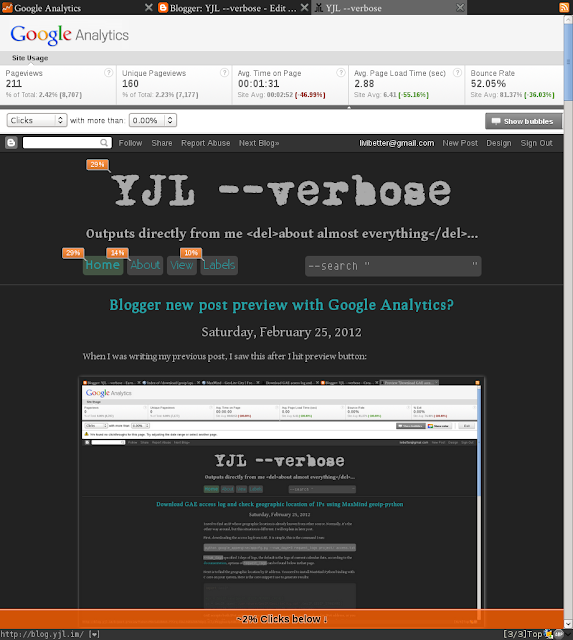 Blogger new post preview with Google Analytics? We found no clickthroughs for this page. Try adjusting the date range or select another page. You got it perfectly right, Google Analytics! Because it's totally new post, how could you find click? If you do, either your are a fortune teller or something gone haywire. But I don't mind this show up when I edit my old posts. It would be nice to know some statistics. 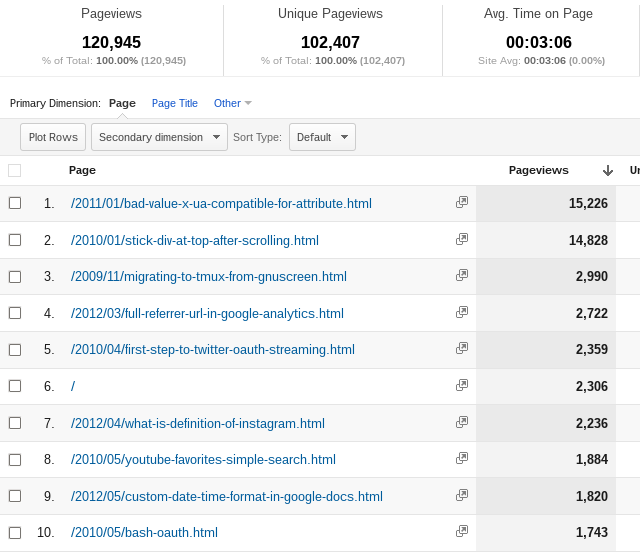 Only it takes a few seconds to load the Google Analytics frame every time you hit preview button. Since Blogger pushed new feature of Stats, I began to see more fake referrer in Stats tab or Google Analytics. 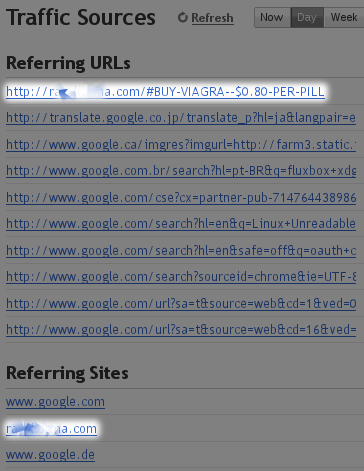 Fake referrer is very common spam, but Blogger Stats needs you doing nothing to read the statistics. It's convenient for bloggers and spammers. Those people who create crappy website have targeted us now. If it spams not only for traffics, but also try to hack into your computer, that would be very bad. Don't click on any referrers that you have no idea what they are. I hate spammers! I just tried to add two entity counts to my app's statistics page. Then I found out, the statistics APIreleased on 10/13/2009, version 1.2.6is not available for development server. But global_stat is always None. The documentation didn't explicit mention whether if the statistics is available for development server or notmaybe I didn't read carefully, neither did Release Notes. PS. I know the code is awful, str / int types mixed, terrible. But I am lazy to add and if clause in template file to check if db_blog_count is None or something like -1, or anything represents the data is not available. PS2. The code should be just if blog_stat: (fourth line) and swap the next two statements if you know what I meant.